buffalosabresnow: The Andreas Athanasiou situation is an interesting one to keep an eye on. The Andreas Athanasiou situation is an interesting one to keep an eye on. 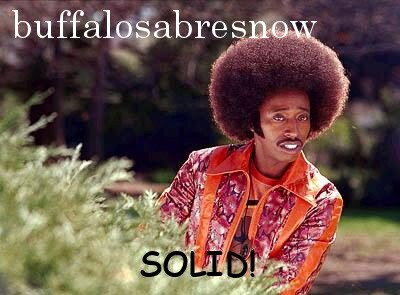 For once the Buffalo Sabres don't have drama surrounding the signing of one of their players. Sabres GM Jason Botterill got all of his restricted free agents signed, and that includes starting goaltender Robin Lehner who had filed for salary arbitration before the two sides amicably came together on a 1 yr./$4 million deal that was a $850,000 bump over his salary from last season. Lehner is in Buffalo as we speak practicing with some of his teammates yesterday, according to a tweet from WGR550 radio's Paul Hamilton. 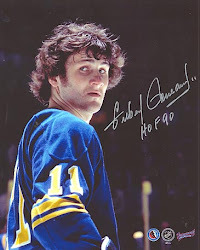 Whether real or imagined, the Sabres had some problems either keeping their own or signing them at a reasonable rate to keep the small market team competitive. At least pre-Terry Pegula. In the six years since Pegula bought the team, things have gone in the other direction with Buffalo overpaying players, but perhaps we're finally at a spot where it's beginning to balance out. As it stands right now, the Sabres are $6.9 million under the NHL's cap-ceiling with all of their players signed, and their 44 pro contracts are under the league's maximum of 50, according to CapFriendly. Also, as of right now, Buffalo is in the mix for free agent defenseman Will Butcher. The 2017 Hobey Baker winner has reportedly narrowed his choices to four team with only two of them being named--Buffalo and the Vegas Golden Knights. Were he to sign with the club (which could very easily happen,) the team still has plenty of wiggle room to add at least another contract or two. Adding talent is the name of the game and one could assume that Botterill is closely watching what's happening with a number of Group-2 free agents who've yet to come to terms off of their entry-level deals. Unsigned restricted free agent problems are the realm of other teams this August and the list incudes some impressive talent. Topping that list would be Columbus Blue Jackets center Alexander Wennberg. The 22 yr. old center is coming off of a strong campaign in his third NHL season with 59 points (13+46) in 80 games. I reached out to hockeybuzz.com colleague Paul Berthelot, who covers the Jackets, to see about the Wennberg situation. Berthelot says Wennberg, "who is a true center that you will not see on the wing," was the used as the team's No. 1 center after Columbus traded Ryan Johansen in the Seth Jones deal. He also speculates that Wennberg might be looking for a Jonathan Drouin-type contract somewhere in the vicinity of 6 yrs./$5.5-6 million per season. Sam Bennett out in Calgary is also have a bit of a problem coming to terms with the Flames. Bennett was taken fourth overall in the 2014 NHL Draft and just finished his second full season with the club. The Flames have some impressive young talent with the likes of Sean Monahan, Johnny Gadreau and Matthew Tkachuk leading their charge of the youngins and Bennett hasn't lived up to his billing as of yet. According to Mark Parkinson of MatchsticksandGasoline, "Bennett hasn’t blown anyone away with his play, yet he really isn’t a bust either. It’s like he’s in some weird middle ground. Is he a true centre? Is he a forward? When will we see that potential the Flames saw when they selected him that high in the draft." Out in Arizona Anthony Duclair had a tough go of it in his second season with the Coyotes. The 2013 third round pick (109th overall) went from 20 goals and 44 points in 2015-16 to five goals and fifteen points last season, a drop that ended up with him being demoted to the AHL's Tucson Roadrunners. Hockeybuzz colleague James Tanner felt that Duclair's drop in production may not have been his fault completely saying, "Last year they acquired [Radim] Vrbata and Duclair lost his job before training camp even started. Then in the first preseason game he got like ten minutes, and the same with the season opener. "He didn't so much have a bad season last year, as his season was self-sabotaged by the coach. [Dave] Tippett just didn't play him, and older guys no longer on the team got tons more minutes and PP time." A dreadful season like that put 5'11" 185lb. left-winger in a weak bargaining position that has him looking at a bridge deal. The most intriguing unsigned RFA, however, seems to be Detroit Red Wings forward Andreas Athanasiou. Detroit is in a very vulnerable position at this time of the off season. There have been huge changes in Motown which includes the loss of owner Mike Illitch earlier this year and the move to a new arena. The Red Wings lost two key components of their Cup Champion team from 2008 in coach Mike Babcock and Pavel Datsyuk and for the first time in over 25 years missed the playoffs. What's worse for them going into the season is that they're $3 million over the cap right now. Although GM Ken Holland will get some relief once the season starts, he may need to make a decision on Athanasiou sooner rather than later. The 23 yr. old forward is supposedly entertaining an offer from the KHL. In his AskAnsar piece at M-Live this morning, Ansar Khan addressed the situation. "I have no idea what a 23-year-old player with 27 goals and 41 points in 101 games could earn in Russia," he wrote, "but I think it would have to be substantially more than what he can get from the Red Wings (my guess is between $1.5 million and $2 million per season for two years) for Athanasiou to go overseas. I doubt that it’s worth going for slightly more money, even though it’s tax-free there." After a fan offered up a 3yr./$9 million deal for Athanasiou, Khan replied, "I’m sure Athanasiou would jump at that deal, but I doubt the Red Wings would offer that much." The reasoning is very simple, according to Khan. He followed that up with an appearance on the Laidlaw and Allen Hockey Report saying, "In my opinion, even if [the Wings] had plenty of cap-space, I think they'd still be in the same predicament with Athanasiou because there is a gap between what they think this 23 yr. old coming off his entry-level contract should be paid and what Athanasiou's camp thinks he's worth. "The Red Wings have always operated under this salary structure," continued Khan, "that this player with a certain amount of experience needs to be slotted in at this level, and they feel they'd disrupt that by giving him more than they feel he should get." Khan points straying from their structure would have a "domino effect" because next year they'll need to re-sign two young, talented players in Dylan Larkin and Anthony Mantha. Athanasiou has a pretty good skill package. He's "an elite skater" said Khan, "and what he's got at a fairly young age is finishing ability. He can make individual plays and when he gets in tight, he knows how to finish and he's proven it despite limited ice-time and limited powerplay time." On the downside, Athanasiou, has been called out by coach Jeff Blashill on a couple of occasions for an inconsistent effort. "He takes too many shifts off," according to Khan, "doesn't pay attention to detail as much without the puck in the defensive end and sometimes his compete-level, as far as winning battles and consistently skating hard, has caused some rifts." It's an interesting case to watch. Athanasiou is obviously talented, albeit with his flaws, but that doesn't seem to be the sticking point as much as a clash of contract philosophies. This isn't the same Red Wings organization that every player wanted to play for under their terms. It actually reminds me of the Sabres and some of their off seasons. Vulnerability makes the Wings/Athanasiou situation very intriguing in that we could see the first offer sheet for an rfa since the ill-fated Flames offer sheet for Ryan O'Reilly in February, 2013. Perhaps the best part about all of this is that the poaching team could go as high as $3,755,233/season and only give up a second-rounder to the Wings. Or if a team feels that Athanasiou could be a key player for their team moving forward, they could offer up a future first rounder, say in 2019, as an incentive not to try and poach him. Do the Sabres have $3.5 million in cap-space over the next three years to use on a talent like Athanasiou? Would they feel a 2019 first-rounder for him would be worth it to avoid an offer sheet? They could do either. It sure is nice to be on this side of the equation.